Exactly as foretold by friends who’ve been, my visit to the United Arab Emirates has been a constant journey between Las Vegas and the Orient. Our hotel The Atlantis on “the Palm” (se picture of it in previous post) was opulent beyond description and with so many people serving that it was close to creepy. As a Scandinavian, it’s almost impossible not to be embarrassed when your suitcases are carried, your chair pulled out and the tap turned on for you in the public toilets. But it’s still wonderful to sleep in a perfect bed, bathe in utter luxury, look out at the azure sea when you pull the curtains and eat delicious meals everywhere you go. Sitting at the pool, studying the most international crowd I’ve ever seen in one place is nothing short of sensational. Most interesting to us were of course the native arabs in their abayas and dishdashas, a good deal of the women with their faces totally covered. We were sick with curiosity as to how these women eat, so took great care to place ourselves so we could see some of them in the restaurants. 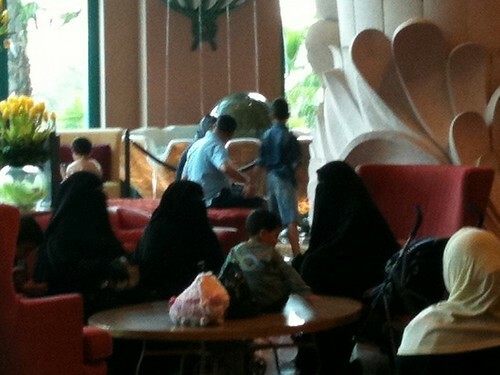 The great majority of them will place themselves with their backs to the crowd and then simply remove the Niqab while eating. We only saw a few who stuck the food into their mouths behind the veil, which I have to admit looks stupidly awkward, but will work well if you need to lose weight. These people seem to be impossibly rich, which you must be to hire the luxury suite at the hotel at a mere £30,000 a night. But then it covers almost a thousand m2! We left the hotel a few times to see some of the architectural feats of Dubai. Firstly, the truly amazing Burj Al Arab hotel in the shape of a giant sail. Both inside and out it takes your breath away. I believe that if the Pharaohs were still around, they’d build like this. Great splendour, lots of gold but still stylish. Click the link above to see the Wikipedia article or click here to see my own pictures. 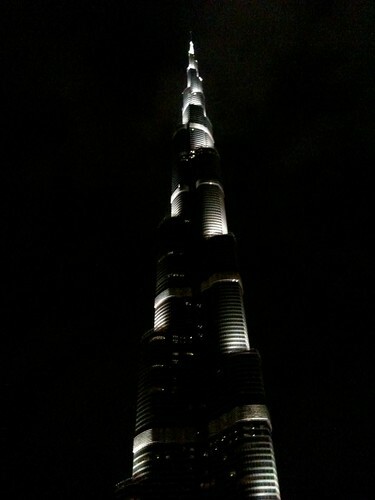 The following day we went to the top of the man-made world, the Burj Khalifa. The elevator to the 124th floor is the fastest on the planet with 10 meters per second. That’s almost as fast as Usain Bolt… There’s a funny story to this fountain pen-like structure. Almost until its inauguration it was called Burj Dubai and signposted as such all over the city and beyond. But as Dubai ran out of money before the completion, they had to borrow a substantial amount from incredibly rich neighbour Abu Dhabi. Suddenly all signs were taken down and when they were put up again a few days later, the building had a new name, the Burj Khalifa. Khalifa happens to be the name of the ruler of Abu Dhabi. Abu Dhabi is where we went after Dubai – it’s a 90 minute taxi ride which will cost you around £40. My visit here with a dear friend will be in my next post. It is now very late and a taxi is picking us up here at 5am tomorrow morning to go home to windy, snowy Denmark.